Do Older Adults Have Different Nutrition Needs? As we grow up and age our food choices differ, but so does the body’s requirement of vitamins and minerals. 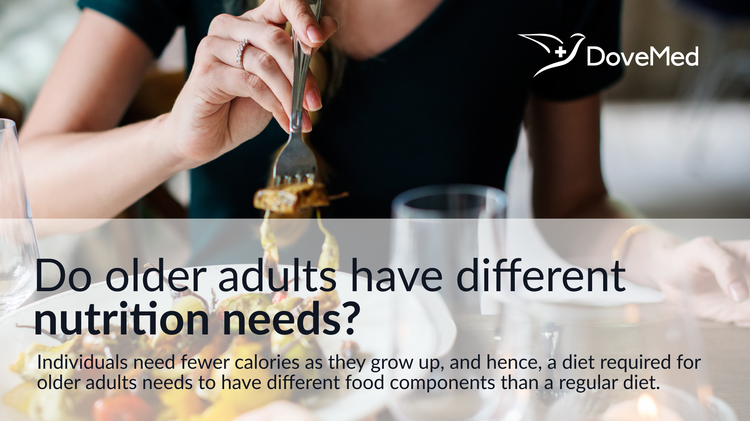 We have different nutrition needs as we grow up. We have entirely different needs and wants for food as adults, than we did as infants. As we grow up and age our food choices differ, but so does the body’s requirement of vitamins and minerals. This is the same for older adults too, though commonly there is a lack of awareness among them. For the sake of definition, the United Nations has generally adopted the age of 60 years to classify the older population. According to a scientific study conducted by Dr. Connie Bales, Associate Director of the Geriatric Research Department of Durham VA Medical Center, we need fewer calories as we grow up, and hence, a diet required for older adults needs to have different food components than a regular diet. The research suggests that as we age, we tend to move around less; thus, our metabolic rate goes down and we suffer from muscle deterioration as well. The challenges while including different food choices when it comes to older adults is in including every component required to stay healthy. Overall, this may be summed up as that older adults have to eat more nutrient-rich diet, added with fruits, vegetables, whole grains, beans, low-fat dairy products, nuts, and lean meat for proteins. As one ages, there is a greater need for more amounts of vitamins and proteins in their diet for energy and metabolism. After the age of 50, our body’s ability to absorb vitamins and minerals reduces slowly, because of insufficient acid production in the stomach. For instance, hydrochloric acid present in the stomach is needed to breakdown vitamin B12 from diet. The same can be said for other vitamins, such as vitamin D and calcium. Aged skin cannot breakdown sunlight into vitamin D properly, which can cause an insufficiency of the vitamin in the body. This vitamin is crucial to help body absorb calcium for growth. Hence, older adults can face a major health problem. To avoid this phenomenon, food choices should be changed according to their needs. As an adult age they tend to move slower and even their gait may be affected. This is due to changes in muscle, loss of muscle strength, and depletion of bone mass or density; a phenomenon that is more pronounced in women after menopause. In order to counter these, along with physical exercise, ones nutritional needs of calcium and vitamin D has to also be increased, including through the use of supplements, if required. According to National Institute of Health for Seniors, older adults are more prone to malnutrition. Their nutritional requirement is very different from other age groups. With old age, energy requirement per pound of body weight is reduced, since both lean body mass and basal metabolic rate decline during old age. The process of ageing affects nutrient needs tremendously. Some nutrients that were required before in lesser quantities are to be taken in larger quantities. Modest decrease in fat and calorie intake considerably reduces high blood pressure and bad cholesterol level in older adults. According to the Mayo Clinic, increasing consumption of fruit and vegetables along with fiber by two to three servings daily could cut an older adult’s risk of getting a cardiovascular risk by up to 40%. Many medical conditions and diseases affecting older adults can be attributed to a lack of properly balanced nutrients in their diet. Hence, diet options for older adults should be changed according to their specific needs, in order that they age healthily. Ahmed, T., & Haboubi, N. (2010). Assessment and management of nutrition in older people and its importance to health. Clinical interventions in aging, 5, 207. Gollub, E. A., & Weddle, D. O. (2004). Improvements in nutritional intake and quality of life among frail homebound older adults receiving home-delivered breakfast and lunch. Journal of the American Dietetic Association, 104(8), 1227-1235. Chang, C. C., & Roberts, B. L. (2008). Feeding difficulty in older adults with dementia. Journal of clinical nursing, 17(17), 2266-2274. Keller, H. H. (2007). Promoting food intake in older adults living in the community: a review. Applied Physiology, Nutrition, and Metabolism, 32(6), 991-1000. Amarantos, E., Martinez, A., & Dwyer, J. (2001). Nutrition and quality of life in older adults. The Journals of Gerontology series A: Biological sciences and Medical sciences, 56(suppl_2), 54-64.